If you are new to Single Malt Whisky this book will give you an interesting and fast insight into Whiskey world and it will surely move you to learn more and more about this deliciously complex spirit. I don’t usually do reviews of whisky books although I have quite a collection of them at home. This book, Whiskey by John Lamond, that has fallen in my hands is part of the Princenton Architectural Press’s Instant Expert series. The idea behind the book is to turn yourself into a expert in a pocket book that you can carry with you. Have they succeed on the task? No, mainly because you can’t be turned into a whisky expert by any book but I have to say it is a quite interesting reading. The book is structured in several parts, each of them quite accessible. The first section is about whisky fundamentals were briefly you are introduced to whisky ingredients, the different steps involved in making whisky, the different types and some tips about how to drink whisky ( you should really read this one if you are interesting in learning how to taste whisky ). 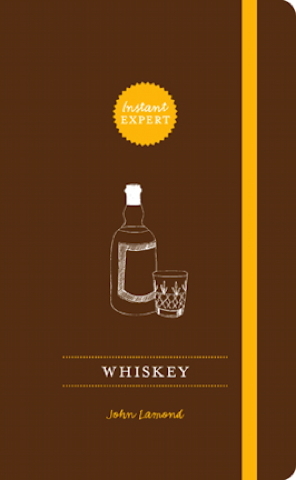 Then the second part of the book is a collection of distilleries information and must-know as well as tasting notes without scores ( but with an useful “Expert Essential” seal on some bottles ) of Single Malts, Blends, Irish Whiskey, American whiskeys and international whiskies. The thrid and quite interesting part of the book is about several topics quite related to the whisky world: how to enjoy the whisky best, bottles and age statements, styles of whisky, tips for buying at auction and retails ( if you really want to save money check prices first at A Wardrobe of Whisky ) and tips about how to store your whisky to get the best of it. Finally it has a list of places where you can learn more about whisky. A decent book about Whisky. And quite good sized.